Checking the poll, feedback has been very positive. One of the suggestions/requests (“other”) is that I have more “full meals”. What a full meal is, I’m not exactly sure – is it a meal that is filling and satisfying, or is it an eight-course dinner? (Haha.) I don’t think I’ll be blogging any eight-course dinners here anytime soon, though meal plans are a possibility for the future. The poll will close Wednesday, March 31st. I’ve made this quite a few times already this week, including this morning, although it can also be eaten for lunch or dinner. Using what I already had in the fridge, the first time, I used a leftover egg white and beat it with a pinch of salt and a little squirt of lemon juice before adding it to the beaten eggs, just because I was feeling fancy. I’ve also used whole eggs. I did not measure the rice. I only used the amount that felt right to me. 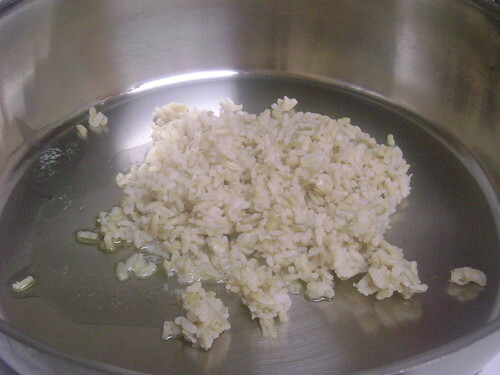 For that matter, I’ve provided a photo of the rice in the pan so that you could get a sense of the amount I used. Use either long or short grain, whatever you have on hand, it doesn’t matter. Sprinkling the onion with a bit of salt helps sweeten it, although this step is optional. First, refry the rice. Heat a fry pan with some oil over medium heat and add the rice and onion. Sprinkle with salt. Sauté, frying until the rice is soft and onion is translucent. Beat the eggs until pale yellow and frothy. If using egg white, beat separately with salt and lemon juice until frothy or soft peaks form. Mix (if frothy) or fold (if soft peaks) into the beaten eggs. Keeping the heat on, take the refried rice and onion out of the pan, transferring to a large plate. Pour some oil into the fry pan and sauté the other half onion and mushroom(s) until browned. Sprinkle with salt. Pour in the eggs. Cook until edges are firm. Move the eggs around in the pan with a flipper or spatula, folding over and breaking up into bite-sized pieces. It’s okay if some of the egg is still liquid; it will cook. Once the eggs are cooked, with the heat still on, mix in the refried rice. 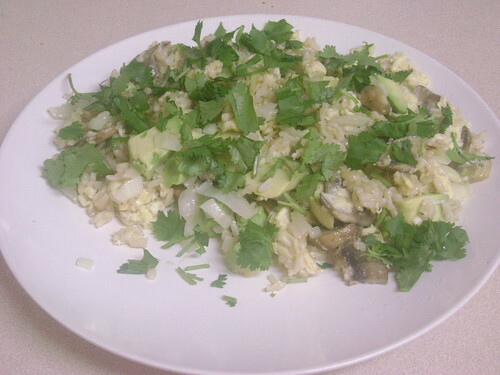 Turn off heat and add avocado, stirring gently so that it isn’t mushed. Transfer the rice and scrambled eggs to the plate (same one used for the refried rice). Garnish with cilantro and season with salt and pepper to taste. Enjoy! These breads look fantastic! Can’t wait to try them out! Thank you! I think you meant to comment on the almond butter bread, instead of this one, which is basically rice and eggs. I forgot to mention in that post that the bread is great sandwich bread and it toasts well. Although I’ve not tried it, the authors (Jenny Lass and Jodi Bager) also say that it makes good French toast.